This hearty Fall Minestrone Soup takes inspiration from seasonal, fresh autumn produce. It’s loaded with fiber, protein, and nutrients and makes the perfect cozy fall comfort food. This post is brought to you in collaboration with S&W Beans, but as always, all opinions are my own. Soup is the absolute best, isn’t it? 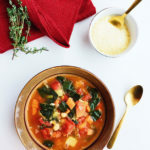 I love everything about a hearty bowl of soup—from prepping and chopping the vegetables, to stirring the simmering pot, to, of course, sitting down and getting cozy with a big bowl. Minestrone always reminds me of my childhood. I can recall my grandma serving us piping hot bowls of the stuff, and everyone topping theirs with copious amounts of grated Parmesan cheese. I truly challenge anyone who says “soup is not dinner.” It sure is. 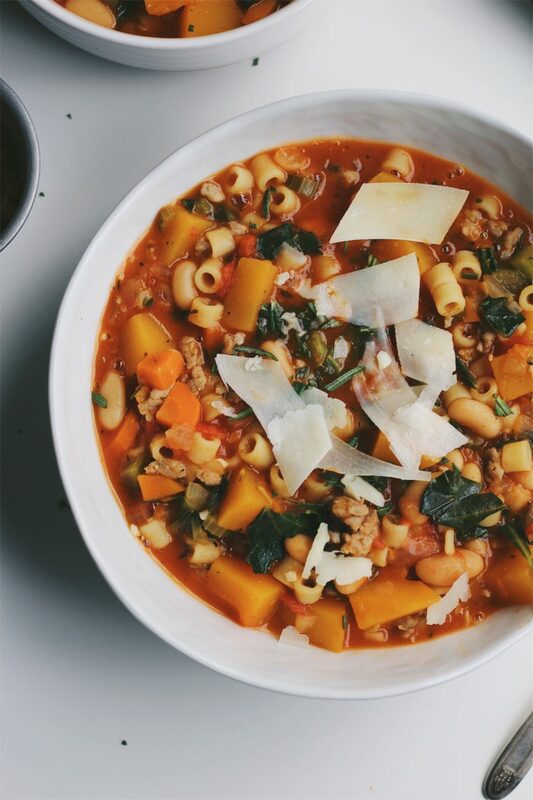 Especially this hearty Fall Minestrone Soup. This Fall Minestrone Soup starts with a mirepoix, high-quality chicken broth, butternut squash, swiss chard, and lots of savory herbs. Mild Italian sausage gets mixed in along with crushed tomatoes, Ditalini pasta, and cannellini beans. For the beans, I use S&W, one of my favorite and most trusted brands. They have tirelessly high standards and have proven them with 120 years of business. When healthy foods are convenient, that’s a wonderful thing. Heart-healthy beans are low in fat, high in protein, and nutrient rich—loaded with antioxidants, vitamins, and minerals including iron, zinc, and magnesium. They’re such a versatile and inexpensive way to eat healthier and include more protein and fiber in your diet. 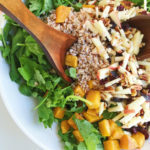 And one serving of this delicious fall-inspired soup grants you 30% of your daily recommended amount of fiber, 20g of protein, and a hefty dose of potassium and iron. 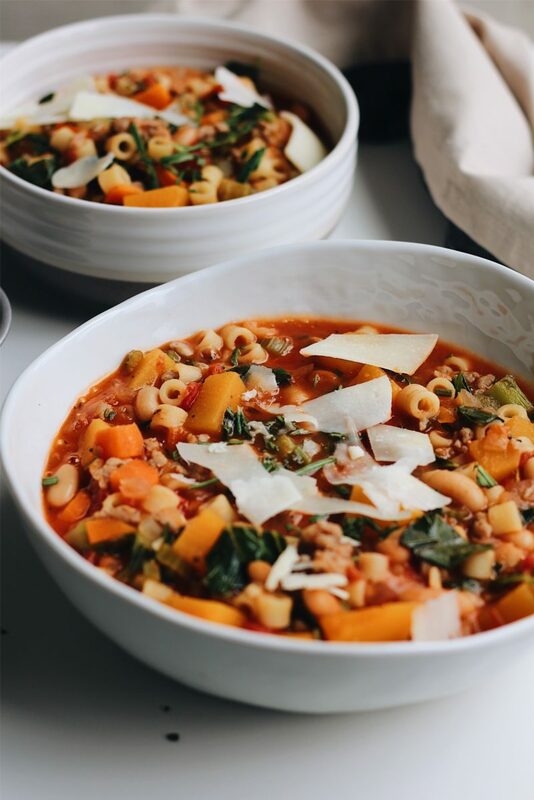 With this delicious one-pot Fall Minestrone Soup, I’m definitely looking forward to some chilly nights. I can see myself curled up next to the fireplace with a cozy blanket and a nice big bowl. 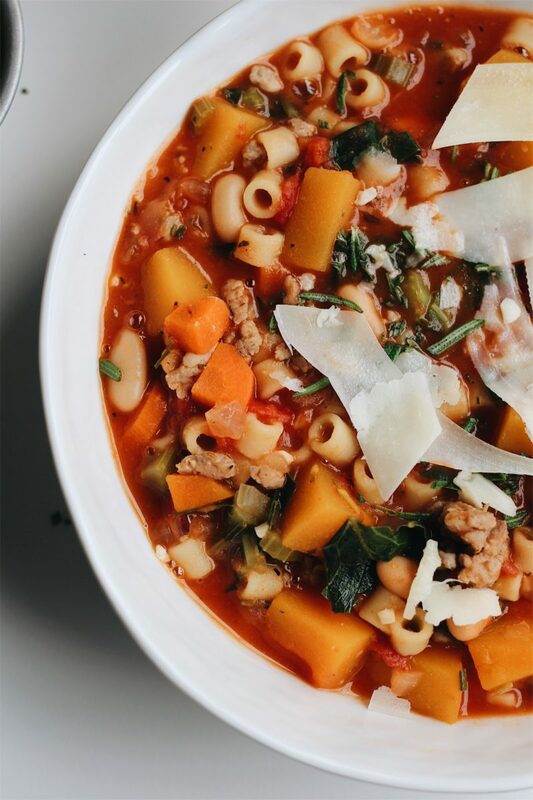 I hope you make and enjoy this Fall Minestrone Soup with Italian Sausage & Butternut Squash! What is your favorite cold-weather soup? Let us know in the comments below. Now through 12/31/17, S&W Beans is offering a $1 off 2 cans coupon. Get (and print) your coupon from the S&W Beans website. 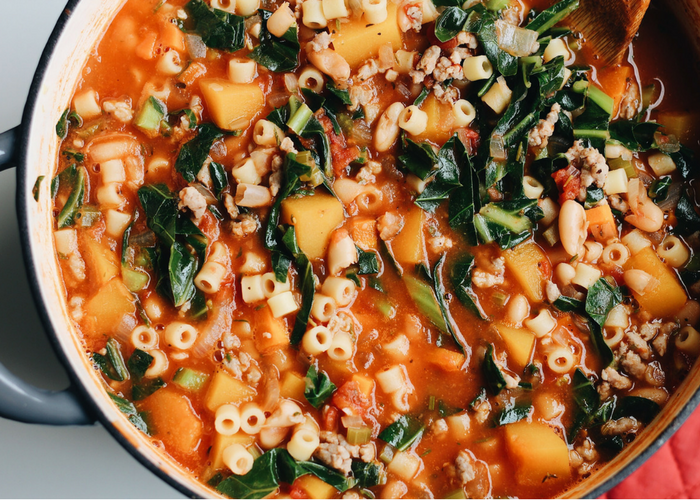 This hearty Fall Minestrone Soup takes inspiration from seasonal, fresh autumn produce. It’s loaded with fiber, protein, and nutrients and makes the perfect cozy fall comfort food. Heat 1 tablespoon olive oil in a deep soup pot or dutch oven over medium heat. 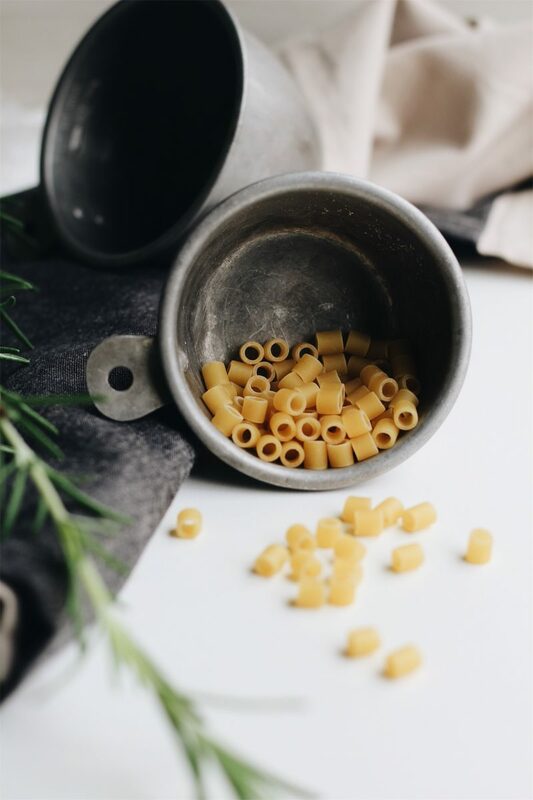 In another pot, boil the ditalini pasta in salted water until just below al dente. Drain the pasta and set aside. To the dutch oven, add the ground sausage, crumble, and season with sea salt and pepper. Cook until browned and using a slotted spoon, transfer the sausage to a bowl and set aside. Add the additional tablespoon of olive oil to the pot and cook the onion, celery, and carrots until softened, but not browned. Stir in the garlic and tomato paste and season with sea salt, pepper, thyme, oregano, and fresh rosemary. Stir in the chicken broth, crushed tomatoes, bay leaves, beans, and butternut squash. Return the sausage back to the pot, and bring the soup to a simmer. Cover the soup and simmer until the butternut squash is cooked through, about 15-20 minutes. Uncover and stir in the Swiss chard, cooking until wilted and tender, about 5 minutes. Stir in the pasta. Taste and adjust for additional seasoning. Serve the soup topped with shaved Parmesan cheese and additional fresh rosemary. Enjoy! This looks soooo good! 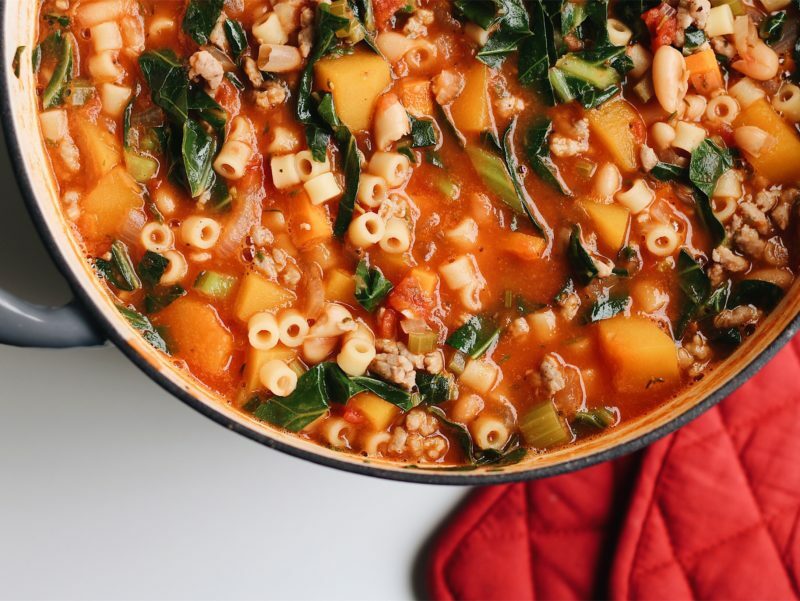 I love minestrone soup but have never made it at home – only ordered in restaurants. I’ll give your recipe a try. Thank you! This soup is AMAZING! I’ve made it about four times already. My husband loves it, the in-laws love it, my own parents love it. This is going in the family cook books! Thank you so much, Sabrina! You made my day. I love that your family loves this soup so much and so happy it’s now a part of your family cookbook and table!! I love soups!!! I make them all the time and this one looks incredible! I pinned this recipe it looks so good! Will be making this a LOT this Winter! Yum this recipe looks so fantastic. We love making soup in the fall. Ooh I love a good soup recipe for Fall and Winter time! This looks delicious…thanks for sharing! My family loved to have soup in every meal and this soup recipe look so perfect to their taste. I will bookmark this for my cooking reference. Yummy! You just can’t beat a bowlful of minestrone soup! This looks absolutely delicious and perfect for these cold evenings. The recipe look simple and cook everything together, the children would love this with no doubt. I would have to add in more Parmesan cheese. 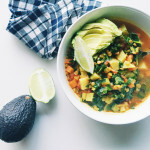 This is an amazing take on minestrone soup! This was one of my favorite soups as a child and as I’ve grown to be an adult, I have fallen in love with all squash! I am looking forward to trying this! This looks like a delicious bowl of comforting soup! I am looking forward to trying this recipe very much. Wonderful! I just made this today on a THURSDAY. It was simple to make but had so much flavor. I didn’t have Swiss chard so I subbed spinach. I’ll be adding this to my weekday dinner menu rotation. 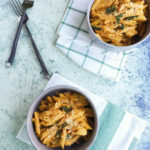 This recipe makes plenty so now we have plenty for lunch tomorrow too! I love having a good bowl of soup for dinner. I really like that you added butternut squash to it and sausage. Beautiful photos. This soup looks delish! This looks absolutely delicious! I am definitely going to have to try this out for my son and I for dinner sometime this week! Thanks for sharing! This does look hearty, and oh so good. Perfect for Fall! This looks like my new favorite fall comfort food! I love a hearty minestrone soup! The soup looks really delish and so ready for fall. Love it. I love minestrone soup but have never had it with butternut squash. I must try it! I make a soup very similar to this during the fall and its our absolute favorite. Mine isn’t a straight minestrone, so this would be a great change! Oh my this looks so good! I just pinned this and definitely will be giving it a try. This is my favorite soup that I order at a restaurant and have never tried at home. Yum! 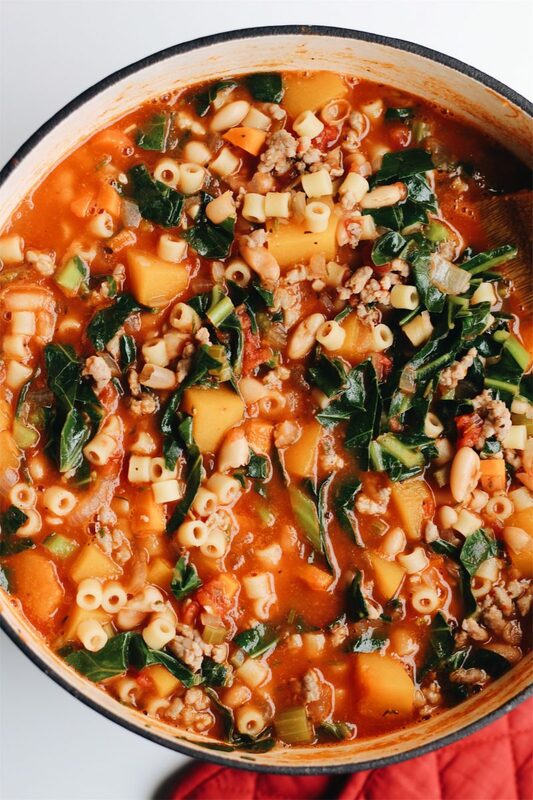 This Minestrone Soup looks so delicious. I wish I could have a big bowl of it right now. I love squash but have never thought to add it to my soup. I will have to get the ingredients I need to make this recipe on the weekend. This is making me hungry! It looks so yummy. 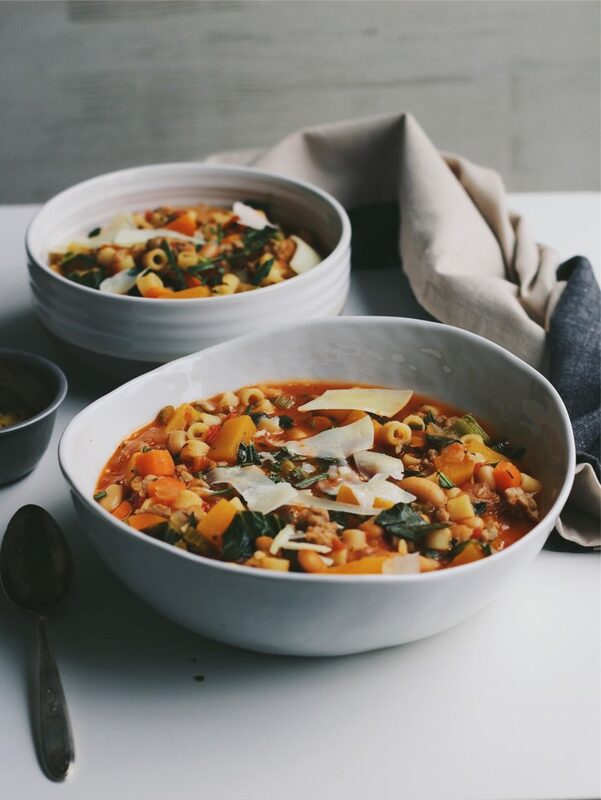 I love a good bowl of minestrone soup and this one is right up my alley. 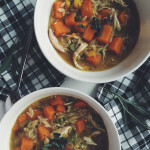 Perfect comfort soup for fall! The images in this post make this dish look so delicious, but I have to admit I have never eaten this in my life. Looks great though! This looks absolutely delicious! I am a huge fan of soups as the temperatures drop, even though they don’t drop much in Florida. I am not sure my kiddos will dig the butternut squash and I might have to trade it out with potatoes, but I will definitely add this into the Fall rotation in our weekly menu. Your recipe looks delicious and I think this is perfect during rainy season especially when serve warm. 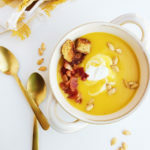 This soup looks amazing, I love the addition of butternut squash, soup, and salad on cool fall nights is my favorite dinner! We are normally not big on soups but lately I have been making them. Will add this to my collection to make. 🙂 I just bought 4 boxes of Ditalini so perfect timing. The weather is really getting colder and this looks like the perfect warming dish for an evening delicious! This soup looks so delicious!!! I’m sure it must taste amazing given all these interesting ingredients!! I just love soup in the fall and winter months. 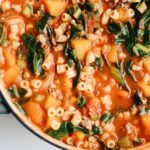 Your addition of the squash really makes this minestrone unique and it looks delicious! Soup is a great way to get veggies into your body. This soup looks so good. Don’t you just love making soup. The flavor choices are endless. 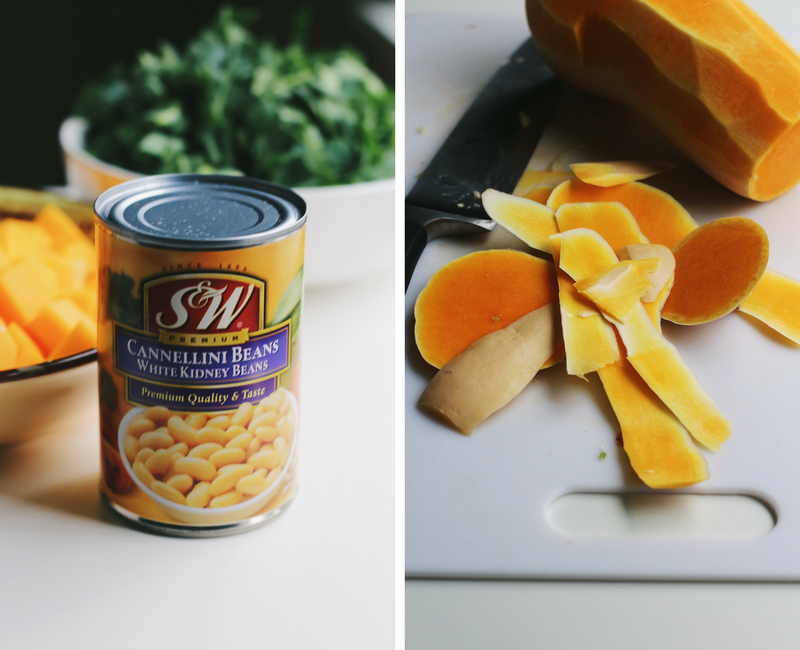 Soup can definitely be dinner! Love the addition of cannellini beans in this recipe. They add a ton of protein but they’re mildly flavoured. This soup has me dreaming of a hole-in-the-wall restaurant we enjoyed in Italy . . . sigh.